My name is Lior Zagury and I’m a very proud Israeli Jew. Yes, it is important for me to present myself in this way, especially today when there is a feeling that there is a festival for anti-Semites. I just came back yesterday from Poland after 8 days of having the privilege of guiding the Inter Disciplinary university students in the death camps. These students, studying in Israel were Jews, Christians and Muslims. Five huge armed commando Polish soldiers with rifles and pistols needed to secure our check in to EL-AL flight to Israel from the Warsaw airport. I know that you got at least 100 e-mails about the flotilla to Gaza and I will not repeat what was said there. I want to speak about something much bigger that is happening now. The header of my letter wasn’t taken from the streets of Berlin in 1933 when the Nazi’s came to power, not from the neighborhoods of Warsaw in 1941 when the Jews lived in the Ghetto, and not even from the shops of Kielce after the Second World War in 1946, just before the pogrom that made Jews understand that there isn’t a safe place for them and they need to leave Europe. The header was taken from signs that were hanged at the entrance to big markets and offices in Turkey in the past few days, in June of 2010 and similar signs that were hung in Jordan. 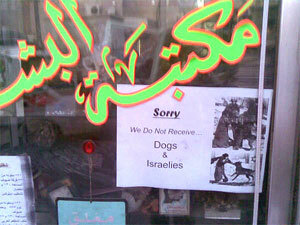 The signs say: “We do not receive dogs & Israelis” as you can see in the photo. What we see around us is not about the flotilla and Gaza. It is a very sophisticated plan to demolish the legitimacy of the existence of the Jewish state of Israel. In his first speech at the German Reichstag at 1/30/1933 Hitler said the cause of all the world problems is world Jewry. Most of the people didn’t take him seriously and felt very safe in their countries, trusting their governments. Twelve years later we lost 6 million Jews in the Holocaust in the worst way that human kind has ever known. These days, 65 years after, Achmadinijad from Iran and many others say exactly the same. The history repeats itself. Most of the people do not take him seriously and feel very safe in their countries, trusting their governments….. If you will ignore it and convince yourselves that this is not the mainstream, this is just a passing storm and that it will never happen to us — sooner or later, you might find those restrictions in your backyard, in your favorite restaurant, in your great bar and in your amazing university as it was 75 years ago. A few months ago, an Arab restaurant in Haifa didn’t allow Israeli soldiers to come in and eat. We need your support now more then ever. We need to raise our heads, speak in a very clear and loud voice and especially be one, united. I have a complete and strong confidence in our nation. Israel has the most moral army in the world, it is the only democracy in the world that in each and every given moment there are thousands of missiles and rockets ready to be launched to the central of its cities from enemies that want to erase us, and the only place in the world that a Jew can just be a Jew and feel completely safe about it. We promised NEVER AGAIN. Don’t wait to say we didn’t know.